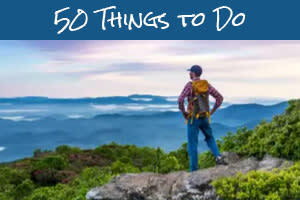 With hundreds of beautiful cascades near Asheville, where do you begin? Here’s a quick sampler to get you started. These 10 locations represent a diverse range of options, so there’s something for everyone. Walk a quarter-mile paved trail (accessible for wheelchairs or scooters) to see the mighty Upper Whitewater Falls across the valley, plummeting 411 feet. Also, take a staircase down to a second overlook. It’s located in the Nantahala National Forest, about 60 miles from Asheville. How to get there: From Asheville, head south on I-26 E toward the Asheville Regional Airport. Take Exit 40 toward Airport Rd. Then, take a right onto N.C. 280 toward Brevard. When you reach Brevard, take U.S. 64 West toward Lake Toxaway/Highlands. At the town of Sapphire, turn left onto N.C. 281 and drive eight miles. Total distance from Asheville is about 60 miles. One of the most beautiful waterfalls in the mountains is also the easiest to experience. 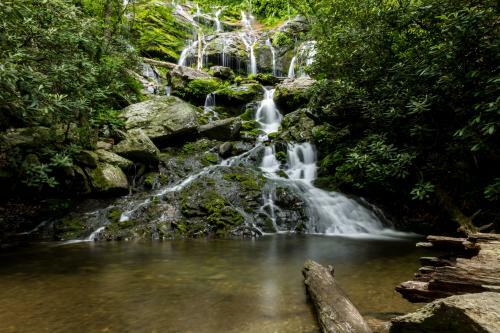 Just 45 minutes from downtown Asheville, this 75-foot waterfall is located along the very scenic U.S. Highway 276 in Pisgah National Forest. Admire it from the roadside observation deck or take the stairs down for a closer look. When the water level is low, it’s a great place to wade and splash. How to get there: From Asheville, head south on I-26 E toward the Asheville Regional Airport. Take Exit 40 toward Airport Rd. Then, take a right onto N.C. 280 toward Brevard. When you reach the Brevard area, turn right onto U.S. 276 N to enter Pisgah National Forest. Drive 6 miles to the waterfall (it will be on your right). Total distance from Asheville is about 35 miles. This stunning swimming hole is a short hike from the Blue Ridge Parkway. Take a half-mile trail to an idyllic setting of multiple cascades with several pools for diving or soaking in the refreshing mountain waters. How to get there: From Asheville, take the Blue Ridge Parkway north to Milepost 417 (Looking Glass Rock Overlook). Park in the overlook parking area and carefully walk across the Parkway to the trailhead. Total distance from Asheville is about 25 miles. 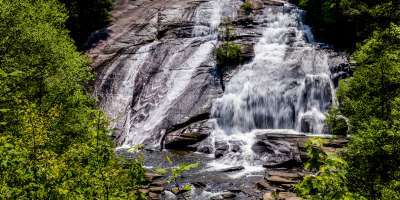 See several waterfalls on a network of trails great for both mountain bikers and hikers, an easy day trip from Asheville. 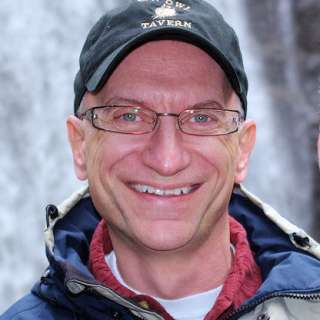 A seven-mile ride takes you to three impressive waterfalls, Triple Falls, High Falls and Bridal Veil Falls. Old logging roads are perfect for beginner bikers. Or, take a connecting trail for a more technical trek. How to get there: From Asheville, head south on I-26 E toward the Asheville Regional Airport. Take Exit 40 toward Airport Rd. Then, take a right onto N.C. 280 toward Brevard. When you reach the Brevard area, turn left onto U.S. 64 East. Go 3.7 miles to the Penrose gas station. Turn right onto Crab Creek Rd. and go 4.3 miles to make another right onto DuPont Rd. Total Distance from Asheville is about 40 miles. This popular stop on the Blue Ridge Parkway is always one of the first and the most brilliant areas for the turning fall leaves in early October. Second Falls is a short walk from the Parkway. Or take the four-mile loop through the colorful meadow along the river to Upper Falls. 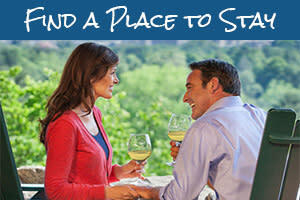 How to get there: From Asheville, take the Blue Ridge Parkway south to Milepost 418.8. There is a signed, designated parking area. Total distance from Asheville is 37 miles. There are only a few waterfalls that you can safely walk behind, and this one is the easiest to reach from Asheville. Located near Looking Glass Falls, the 50-foot waterfall cascades gently over an arching cliff. It’s a great one to take the kids to, since the three-quarter-mile hiking trail is not difficult. Check out our guide on the Moore Cove Falls trail to learn more. How to get there: From Asheville, head south on I-26 E toward the Asheville Regional Airport. Take Exit 40 toward Airport Rd. Then, take a right onto N.C. 280 toward Brevard. When you reach the Brevard area, turn right onto U.S. 276 N to enter Pisgah National Forest. Drive 6.5 miles to a paved parking area on the right. Total distance from Asheville is about 35 miles. Your dog is guaranteed to enjoy this 3-mile roundtrip hike through the woodlands of Pisgah National Forest. The trail to the waterfall follows a cascading stream with plenty of spots for a quick splash in the water. And, it’s a great winter hike since this area seldom receives heavy snow. Remember to keep your dog leashed for their protection. 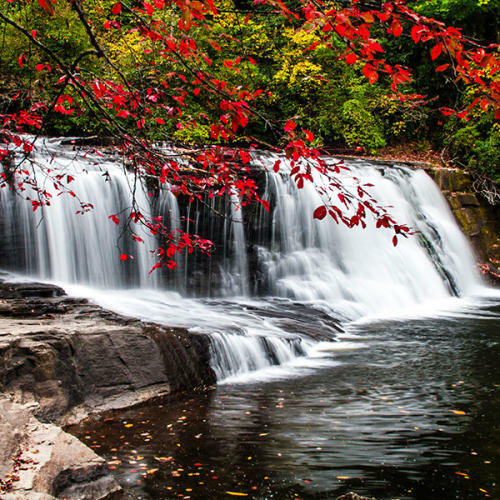 For more, take a look at our guide to the Catawba Falls Trail. How to get there: From Asheville, take I-40 east to Exit 73 (Old Fort). As you exit the interstate, take a right onto Catawba River Rd. Drive three miles to the parking area at the end of the road. Total distance from Asheville is about 25 miles. This waterfall along the Blue Ridge Parkway is absolutely beautiful. And the three-mile loop hike is a showcase of wildflowers. A bridge that crosses the creek below the falls has a bench for front row seating for the best show around. How to get there: Take the Blue Ridge Parkway north out of Asheville to Milepost 339.5. Total distance from Asheville is about 45 miles. 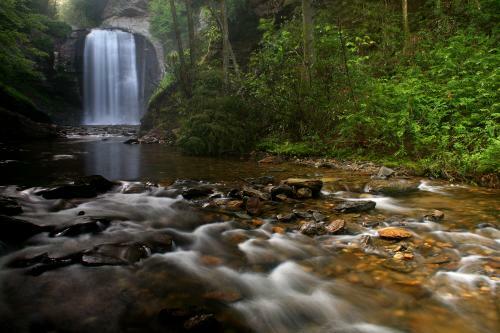 Hike a loop trail to see three waterfalls in the Great Smoky Mountains National Park. During the summer, tube down Deep Creek from Indian Falls to Tom’s Branch Falls, a very popular tradition for many families with great fun for all ages. How to get there: From Asheville, take I-40 W to Exit 27 for U.S. 74. Continue on U.S. 74 (Great Smoky Mountains Expressway) to take Exit 67 toward Bryson City. Turn right onto Main St. Turn right onto Depot Street. Take a slight left onto Collins and quick right to get back onto Depot St. Depot Street turns into Deep Creek Rd. Follow Deep Creek Rd. into Great Smoky Mountains National Park to the parking area at the end of the road. Total distance from Asheville is 65 miles. See a rare twin waterfall just a few steps from Highway 19 between Maggie Valley and Cherokee (and just 1.5 miles from the Blue Ridge Parkway). A short trail takes you to an observation deck, so it’s another location that everyone can easily enjoy. How to get there: From Asheville, take I-40 W to Exit 27 for U.S. 74. Then, take Exit 103 for U.S. 19 toward Maggie Valley/Cherokee. Drive 13 miles to a small pull off on left. Total distance from Asheville is about 41 miles. This majestic 404-foot waterfall in Chimney Rock State Park was featured in the movie blockbuster The Last of the Mohicans, with the climatic fight scene occurring at the top of the falls. A three-quarter-mile mile trail takes you to the base of the waterfall. Also, when you are down in the village of Chimney Rock, remember to look up for a very dramatic view of the falls. Learn more about Chimney Rock State Park by taking a look at our guide. How to get there: From Asheville, take I-240 E to Exit 9 (Highway 74A E to Bat Cave). Follow 74A/Hwy. 64 to Chimney Rock Village and the park entrance on the right. Total distance from Asheville is about 25 miles. Top photo by Hugo Gutierrez. Looking Glass Falls photo by Ben Pierce. Catawba Falls photo by Hugo Gutierrez.